Nudges attempt to subtly change the environment in which people make decisions to help them make better choices — better for themselves and for society. People all over the world are becoming increasingly concerned about the health of the natural environment. For over 40 years, the phrase “think globally, act locally” has urged people to consider the health of the entire planet and to take action in their own communities. Individuals have long been encouraged to save energy at home and at work, and to choose environmentally friendly food and other goods. But studies suggest that people still fail to make even small changes in their behaviour to address the negative environmental consequences of their actions. In the past, most conservation and sustainability initiatives have used the sledgehammer approach to aggressively pursue behavioural shifts. However, there is plenty of evidence to suggest that “nudges” are a more effective solution. By making small changes that exploit our judgemental biases, nudges re-engineer the environment in which decisions are made. One of the best examples of a nudge shows that by making driving license applicants organ donors by default, organ donations could be as much as 20 times higher than where the reverse is true. This subtle change to the default option from “opt-in” to “opt-out” dramatically affects participation rates, despite only changing which box people check on a form. Worldbeing is self-directed wearable and app that aims to help people reduce their carbon footprint, by making it engaging and social. Supported by the Carbon Trust, the app tracks users’ carbon usage to increase their understanding, and to encourage action by linking daily activities to their impact on the climate. Worldbeing aim to drive real change by helping a community of likeminded people make lifestyle changes to improve the wellbeing of the planet. Other companies, like Smart & Blue with their Hydrao Showerhead, help to encourage sustainable habits in the home through positive reinforcement. Hydrao is an environmentally friendly connected device that tracks water usage in the shower. By using LED lights to warn the user of excessive water usage, turning different colours when different thresholds are reached, it educates people about water conservation in the process. Some brands such as Lush Cosmetics and Recyclebank are also bringing exciting “eco-innovations” to market. The aim is to nudge people towards waste-reducing behaviour through gamification and fun. For example, one game designer has created a card game called Waste-Not that encourages players to rethink uses for common objects that may otherwise end up in the bin. Growing evidence shows that these nudges do change policy-relevant behaviours, while being inexpensive to implement. This success has led to the formation of the world’s first sustainability hub – bringing together ideas for sustainability based on nudges rather than big actions. The U.K. and U.S. governments have even set up behavioural insights teams (or “Nudge Units”) to find and quickly disseminate behavioural nudges for public policy. 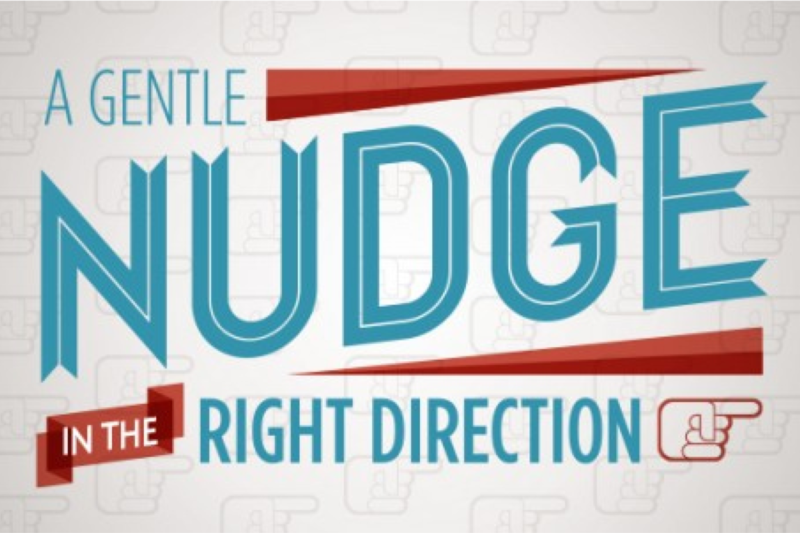 All of the apparent benefits of nudges don’t come without their controversies though. The use of subtle manipulation tactics may not seem entirely ethical to some people, and what counts as a public benefit is never straightforward. Conflicting interests often compete, and whose interests get prioritised can be highly controversial. Nonetheless, we are already exposed to a web of influences, and many of these are negative. Cities are designed in ways that make driving easier than cycling, and many goods are designed and marketed to be bought and discarded in increasingly wasteful cycles. Nudging is about creating a choice architecture that guides towards an environmentally-friendly outcome. So rather than an unacceptable form of manipulation, nudges are a common-sense approach to helping consumers make informed decisions about the effects they personally could have on the environment.